We’re mobilizing people over 50 to help young people who need champions. 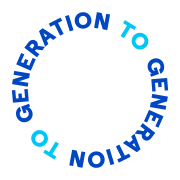 Generation to Generation (Gen2Gen) is a diverse, action-oriented community of people who believe that experience matters, and that the goal of later life isn’t trying to remain young: it’s to be there for those who actually are. Because every child deserves a web of support, and every older adult has something to give. The campaign shines a light on the mutual benefits of intergenerational relationships already happening, and features countless opportunities for people to get involved.